The same day DWP executives presented the proposed five-year plan to commissioners, the department rolled out a new website, myladwp.com, to make its case direcly to the public. With the slogan, "Putting customers first," the site includes slickly-produced videos describing the benefits of upgrading the water and power systems, and the increased risk to system reliability if they are not. The size of the rate increases would vary depending on comsumption level, ranging from 1.4 to 6.1 percent annually. Over five years, the current monthly bill would increase more than 20 percent for those the DWP characterizes as "high use residential" (monthly consuming 900 kilowatt hours or more of electricity, and 2,700 cubic feet or more of water). At that level, a customer currently pays $292.33. That would go up to $380.52 in 2020. Actual DWP bills are in fact higher because they also include sewage treatment and solid waste collection fees. "We'll have a lot of questions for DWP during the process," said Dr. Fred Pickel, a ratepayer advocate for the city of Los Angeles. The primary goal of increasing rates is to generate more money for replacement and upgrading of aging infrastructure, said Marcie Edwards, DWP general manager. Some of the mains in the water system have not been replaced since the trailblazing era of the legendary William Mulholland a century ago. Nearly half the city's power poles - 45 percent - date to LA's postward expansion and, being more than 60 years ago, are beyond their projected lifespan. On the power distribution side, DWP faces a mandate to be generating at least a third of its electricity for renewable sources by 2020, and to eliminate use of coal as a fuel source by 2025. The last rate increase was approved in 2012. In recent years, the DWP's once sterling reputation has been jolted by a series of crises, including the botched rollout of a computerized billing system, the inability of customer service to handle the volume of complaints, and criticisms of the department for not exercising more fiscal responsibility. Some of the increased funds from a rate increase would also be used to improve customer service, Edwards said. For a time there were complaints of wait times stretching into hours, and the inability of DWP to resolve billing errors that in many cases stemmed from estimated consumption rather than actual meter readings. DWP has reduced average call wait times to less than three minutes, but half a percent of billings - which would be approximately 50,000 a year - still require management review, Edwards told commissioners. Compensation levels of DWP employees have made them the subject of both envy and criticism. In many cases, DWP jobs have paid better than comparable positions in other city departments. Edwards told the Board in the past year, DWP has been able to negotiate reductions in labor costs of hundreds of millions of dollars. In recent years DWP has walked a tightrope, insisting its maintenance and infrastructure replacement program have reduced the incidence of water main breaks, but at the same time insisting the department needs additional funding to do more. 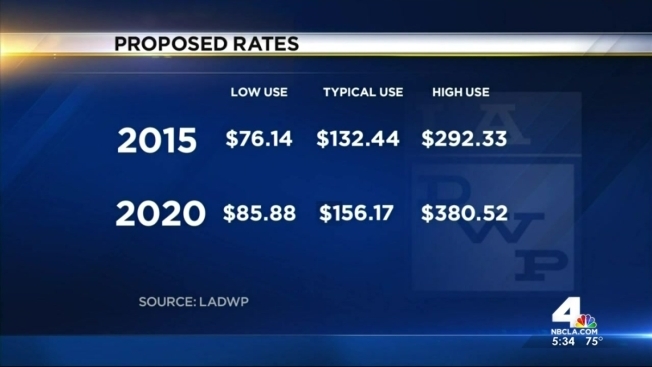 Some of the improvements planned by DWP will help customers reduce their water and power consumption, which will tend to reduce the impact of rate increases, said Guy Lipa, former aide to Mayor Eric Garcetti and now DWP's Chief of Staff. "Part of this is to give consumeeres incentive," Lipa said. Before a new rate structure can take effect, it must be approved by DWP Commissioners, and then go before the City Council, which cannot adjust the rates directly, but in the past has attached performance requirements of DWP to the approval. The process of getting to to the City Council is expected to take as long as five months, Edwards said, and will include a series of public hearings in various parts of the city. Even with approval of higher DWP rates, they would still be lower than what residents of most other California cities pay, Lipa said.